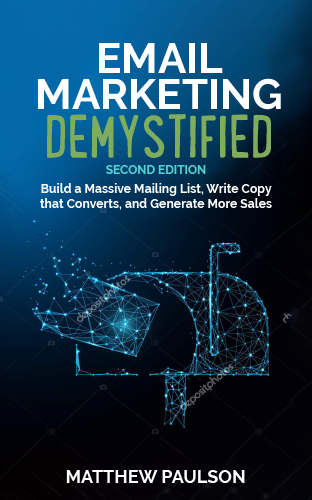 The second edition of my best-selling email marketing book, Email Marketing Demystified, is now available on Amazon. It is currently available in paperback and Kindle formats and will be available as an audiobook soon. Last fall, I was teaching a class on email marketing at the Zeal Center for Entrepreneurship in my hometown of Sioux Falls, South Dakota. During the question and answer section of my talk, a friend noted that Email Marketing Demystified was written in 2015 and wondered if there was any out of date information in the book. I thought the book was still largely current and responded as such, because this book is as much about principles and strategies of marketing through email as it is about specific technologies and platforms. Regardless, I decided to give Email Marketing Demystified a quick read through after the class. I didn’t find anything woefully out of date or inaccurate, but there were some sections that I thought could be expanded upon. There have also been a handful of legal and technical developments since Email Marketing Demystified was first published in 2015. The technology, strategies and tactics that surround email marketing have not changed significantly since the first edition of the book was published. This is a testament to the stability and longevity of email as profitable marketing tool. The biggest recent development in email marketing came from a change in European law, when its General Data Protection Rules (GDPR) went into effect in May 2018. GDPR grants significant new rights to European consumers about how companies store and use their data, which has major implication for email marketers that have subscribers in Europe. The other significant development is that major email service providers’ spam filters have gotten much stricter. Both Gmail and Hotmail have raised the bar for letting commercial messages to get into the inbox, which makes list hygiene more important than ever. In response to these two developments, I have added a new section on GDPR compliance to chapter eight of this book and have added some new ideas about improving deliverability that I have picked up during the last several years. At MarketBeat, we have now sent over 1 billion emails to our subscribers since launching our service in 2011. Our email marketing program has grown significantly in the four-year period since Email Marketing Demystified was first released. We have grown our email list from 250,000 subscribers to over 900,000 subscribers during that time. We continue to have more than 20,000 new subscribers register for our daily newsletter organically each month. We also now spend more than $100,000 each month on paid advertising to grow our email list through co-registration advertising and lead generation networks. In 2018, we sent more than 400 million permission-based emails and generated $6 million in revenue from premium newsletter subscriptions, newsletter sponsorship ads and dedicated advertising emails to our mailing list. Another major development for MarketBeat has been the advent of web push notifications (also known as browser notifications). Web push notifications are a fundamentally different technology than email, but many of the same concepts and strategies of email marketing apply. This technology is built into every major desktop web browser and is incredibly powerful because it allows you to send notifications to your website visitors that have opted-in after they have left your website. You can use your web push notification list to promote new content on your website, your products and services or even the products of your advertisers. In effect, your web push notification list is a second email list. Our business has attracted more than 300,000 web push subscribers and has generated more than $1 million in revenue from web push notifications in 2018 alone. I believe so much in web push notifications as a digital marketing tool, that I have added a brand-new chapter to the end of the book that teaches how to leverage web push notifications in your online business. In addition to the new content about web push notifications, GDPR compliance and email deliverability, I have gone updated each chapter of Email Marketing Demystified to include my latest tips, tricks and ideas. I have added new recommendations for tools and services for you to use as part of your email marketing efforts. Email marketing is truly the core of our business and I sincerely hope that you will be able to benefit from the skills, knowledge and strategies I have picked up while building MarketBeat during the last decade. 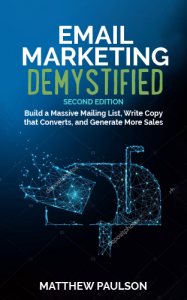 If you’d like to grab a copy of Email Marketing Demystified, head on over to Amazon and get your Kindle copy or order a paperback if that’s more your style. If you find the book helpful, please leave a review of the book on Amazon so that I can do a better job of writing my next book and so that other people know what the early readers of the book think about it.